The VW Golf Alltrack pushes the popular vehicle into a new market with a more rugged version of the Golf Estate that offers off-road driving dynamics. VW attracted a lot of attention with its excellent Passat Alltrack and this new model also blends a higher suspension, rugged looks and all-wheel drive to provide an efficient and practical option in a small family estate car. While there are some similarities to the firm’s sibling, the Skoda Octavia Scout, the Volkswagen Golf Alltrack has an automatic all-wheel drive system which will switch from front wheel drive to 4WD should its sensors detect problems with traction. 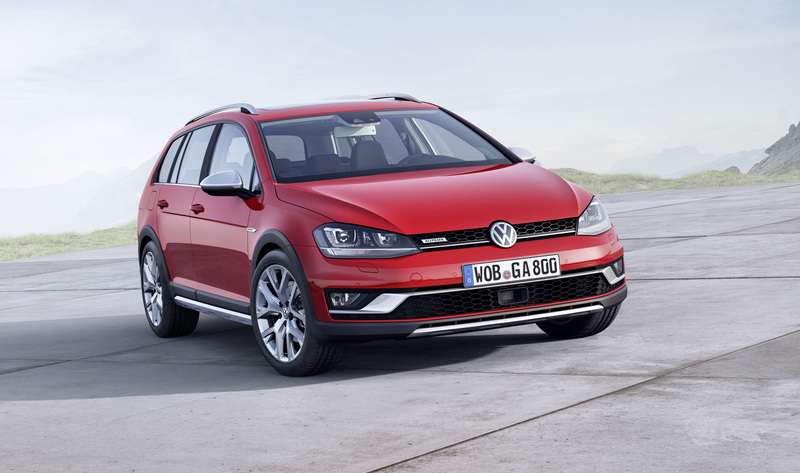 The Golf Alltrack is not a true off-road performer, but its raised suspension and grip will offer excellent performance over rough ground and boggy fields. Like other cars in the sector, VW has added rugged parts to protect it from off-road damage including wheel arch mouldings and flared sills. From launch, there’s only the 1.8 TSI petrol engine, which produces 177 bhp on offer which will sprint from 0 to 62 mph in nearly 8 seconds and its top speed is 135 mph. Owners should expect fuel economy of 42mpg and CO2 emissions of 158g/km. However, VW is offering a range of three diesel units, including the firm’s excellent 1.6 TDI which produces 108 bhp and which will go from 0 to 62 mph in 12 seconds with a top speed of 116 mph. The real attraction to this unit is that it will return around 60mpg while it’s CO2 emissions of 124g/km. The most popular model will likely feature the 2.0 litre TDI engine which will take the VW Golf Alltrack from 0 to 62 mph in 7.8 seconds and have a top speed of 136 mph. The interior for the new Alltrack is very similar to the current Golf line-up which means that everything is well laid out, well-designed and within reach. There is however, lots of standard equipment on the new car including cruise and climate control, the firm’s driver alert system, and an excellent touchscreen infotainment system. VW says its new car is effectively a crossover between an SUV and an estate to offer excellent levels of off-and on-road performance. The VW Golf Alltrack will go on sale in the middle of next year with prices starting at £22,000. This entry was posted in Car Leasing, Cars, Crossover Cars, New Cars and tagged lease the VW Golf Alltrack, VW Alltrack, vw golf, VW Golf Alltrack by Steve Lumley. Bookmark the permalink.